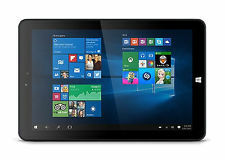 The Linx 1010 features a powerful Quad-Core Intel processor and all the features of the latest Windows Operating System, viewable on a 10.1” display. Immerse yourself in the new Windows 10. The Edge browser allows users to scribble on web pages and share them with other users. The Linx 1010 features two full-size USB ports to connect additional devices, while also connecting a mouse and a USB key while charging your tablet through a separate micro-USB port. The Linx 1010 can be docked into the official Linx 1010 keyboard dock to seamlessly transform your tablet into a powerful two-in-one device for a versatile Windows experience whether its touch or type. For a professional way to display information and interact with your audience at an event, rent a Tablet today by contacting our sales team.